Some Washington officials have pushed for decades to enact laws intended to reduce gun deaths by making firearms more secure at home. With Initiative 1639, voters in November will have a chance to weigh in on so-called safe storage laws. For more than two decades, some Washington officials have pushed for laws intended to reduce gun deaths by making firearms more secure at home. Those efforts — from an unsuccessful ballot initiative in 1997, to legislation sponsored year after year at the state Legislature — never came anywhere near to becoming law. But 2018 has become a consequential year for so-called safe-storage laws. This summer, the cities of Seattle and Edmonds each passed local laws allowing civil penalties to be levied against people who have not secured their guns. Those actions promptly drew lawsuits by the National Rifle Association and Bellevue-based Second Amendment foundation, which point to a state law that bans local jurisdictions from enacting firearms regulations. On Monday, the Metropolitan King County Council approved its own safe-storage law with civil fines of up to $1,000. It too, is likely to draw a lawsuit. The new statute overcame the opposition of a handful of council members concerned about potential legal fees and worries that it could prevent gun owners from fending off a home invasion. “When firearms are stored securely, it means that these tragedies are less likely to happen,” Councilmember Joe McDermott, one of the measure’s sponsors, said before the vote. Before those lawsuits are resolved, Washingtonians will weigh in on safe storage. Frustrated after proposals again stalled this year at the Legislature, advocates of tighter gun restrictions have put a safe-storage component into the sweeping gun-regulations proposal known as Initiative 1639. Voters on Nov. 6 will have a chance to approve or deny the 30-page initiative. With the continuing string of high-profile mass shootings, the part of I-1639 that has gotten the most attention is the provision raising the legal purchase age of semi-automatic rifles to 21, from 18. But state data has shown handguns cause more firearm deaths than long guns, and far more people die by suicide than by homicide. Of the 686 firearm-related deaths in 2016 in Washington, 515 were attributed to suicide, according to the U.S. Centers for Disease Control and Prevention. “I think the impact of safe storage will primarily be preventing teen suicides,” said Rep. Ruth Kagi, a Democrat from Seattle who for years sponsored safe-storage proposals in the Legislature. The provision in I-1639 is more strict than those enacted this year by local governments. 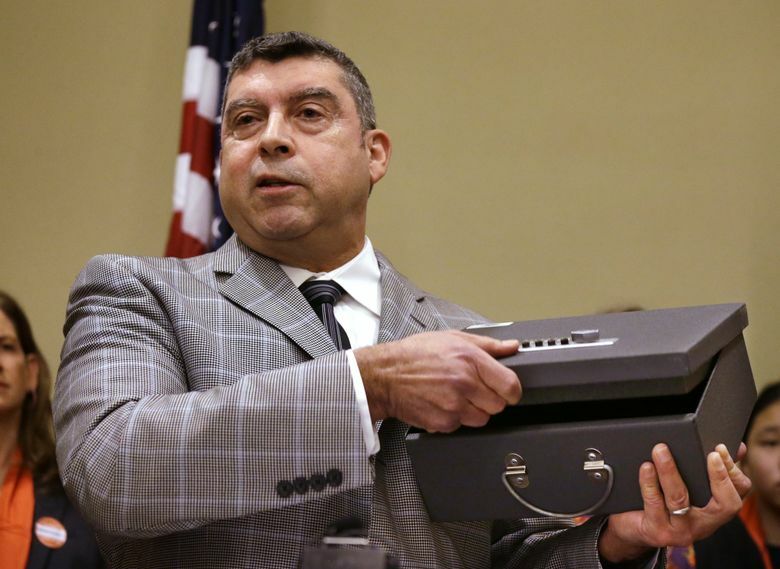 It requires owners to keep guns secured with a lockbox, safe, trigger lock or similar device if kept in a place where a prohibited person — such as a child — could get them. But instead of a civil penalty, it creates gross misdemeanor and felony charges of “community endangerment.” Owners could be charged under those if a prohibited person gets access to a firearm and displays it in public, causes it to discharge or uses it to commit a crime. “That liability, the accountability model is actually one of the most effective ways” to prevent gun violence, said Rebecca Johnson, lead policy advocate for the I-1639 campaign. The initiative campaign is spearheaded by the Alliance for Gun Responsibility, which has been able to rely on top-dollar donors like venture capitalist Nick Hanauer, Microsoft co-founder and philanthropist Paul Allen and former Microsoft CEO Steve Ballmer. That trio, or their family members, account for about $3.6 million of the about $4.5 million raised so far by the campaign. A host of groups, from the NRA and Second Amendment Foundation to smaller campaigns such as Save Our Security, are opposing the initiative. The NRA campaign has so far raised about $184,000, with most of that donated by the group itself. Save Our Security has raised nearly $26,000. Gun-rights supporters balk at every part of I-1639 — and the safe-storage provision is no different. From the NRA and Second Amendment Foundation down to opponents on the King County Council, they worry that such laws would hinder gun owners’ ability to defend themselves. “The strict mandated requirement of this initiative will force individuals to lock up their firearms and render them useless in a self-defense situation, or face criminal prosecution,” Alan Gottlieb of the Second Amendment Foundation wrote in an email. King County Councilmember Kathy Lambert, who voted against Monday’s proposal, said longer response times for law enforcement in rural areas means homeowners must be able to defend themselves. “I think it’s another example of not understanding how people in a rural area use their guns as a tool,” Lambert said of the county proposal. And 11 states have laws that either require or encourage the use of trigger-lock devices, according to the National Conference of State Legislatures. In Washington, some lawmakers have long sought safe-storage laws. In 1997, the year after a child named Whitney Graves died by the hand of another child in an accidental shooting, lawmakers in Olympia discussed a proposal. Also in 1997, Washingtonians overwhelmingly voted down Initiative 676, a ballot measure that, among other things, would have required handguns to have trigger locks. This year could be different. The Alliance for Gun Responsibility successfully pushed through gun-regulation ballot measures in 2014 and 2016. King County Councilmember Reagan Dunn even cited I-1639 as one of the reasons he voted against Monday’s ordinance.